January and February economic accounts for China are notoriously difficult to judge because of the non-uniform occurrence of the Lunar New Year. That is why, for example, China’s National Bureau of Statistics doesn’t even bother with industrial production, retail sales or fixed asset investment in those individual months, preferring to combine them together in one release encompassing both January and February so as not to skew any single monthly comparison. Chinese trade figures do not follow that pattern and are released for all calendar months individually. Unfortunately for them, the depth of contraction in February leaves nothing to “seasonal” adjustments. With exports contracting at -25.4%, the holiday week doesn’t even figure so large was the decline. 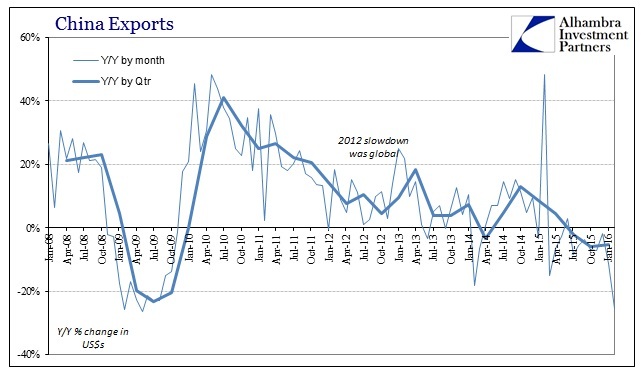 The import side fared little better, with imports dropping another 13.8% and estimated at less than $100 billion for the first time in any month since February 2010. Combining both January and February, imports cumulatively declined 16.6% which only continues the same contraction trend that dates back to late 2014 no matter how much “stimulus” from fiscal or monetary agents. There is no reviving Chinese “demand” for materials, which begins to explain why countries like Brazil are facing depression. 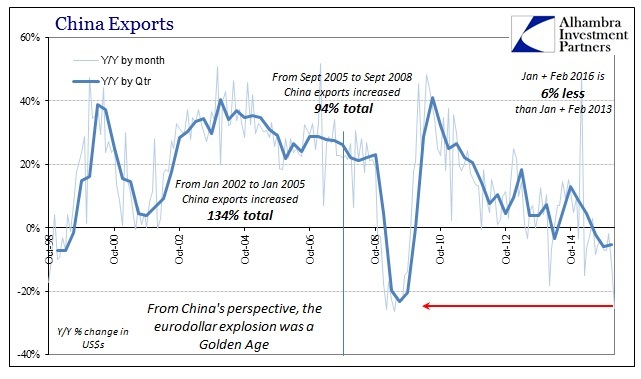 If there is a problem with Chinese “demand”, and there clearly is, then it can be traced to the export sector which has been the bedrock of the Chinese “miracle” all throughout the eurodollar age. It was the eurodollar system’s ascent that financed these growth rates on both sides (consumers and producers), so without the eurodollar push there is no global “demand” to keep it all going. China’s poor data fit with trade results from other exporters in the region. Last month, Taiwan’s exports fell for the 13th-straight month—the island’s longest export slump since the global financial crisis—while South Korean exports declined for the 14th consecutive month. China’s February results were the weakest since May 2009, when exports fell 26.4%. Sun Sandy, sales manager at Yancheng Shunyu Agricultural Machinery Co. in the eastern city of Yancheng, said the global environment has made it tougher to export the firm’s tractor parts to Europe, the U.S., Africa and Southeast Asia. There is an almost detached resignation (intentional?) with how all of this is described, as if it is ever just normal that economic growth in any significant account should be cut by a quarter – especially relating to China. The lack of urgency to the commentary is striking, perhaps as nothing more than just shock for all these mainstream outlets that have been pitching recovery, recovery and more recovery for so long they are stunned to find it was never real. That is doubly so given that China was both supposed to be the world’s growth engine (and you only need to go back a couple years to find that one) and when it faltered that stumble was assumed only Chinese. That entire passage fits in a world that doesn’t exist. 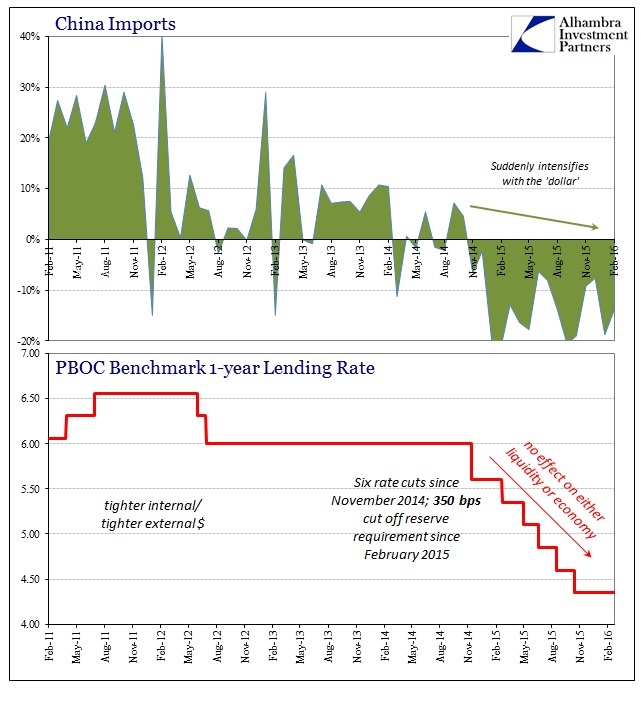 China’s trade statistics don’t suggest “lackluster” at all, rather pure alarm. China is and has been a reflection of the global economy since it was built throughout the late 1990’s and middle 2000’s (again on eurodollars) to service it as its primary producer. If Chinese industry is not producing because Chinese exporters aren’t exporting then it is plain silly to suggest China’s problems are Chinese. To decay at increasingly steady and already significant rates is to suggest the global economy not “cooling” but flailing, falling or just plain failing. We don’t know exactly which one yet because so many statistics were never designed for these broader, structural circumstances. As I note every month with China’s exports, the baseline is absolutely clear so much as it is absolutely nothing like what was expected and intended (“stimulus”). 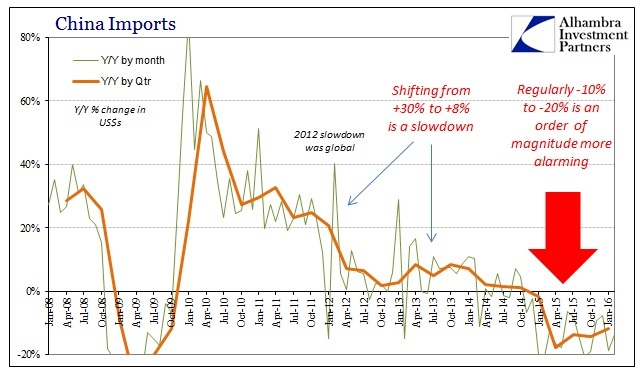 Prior to 2008, exports grew by 30% month after month; 20% used to be the standard for a slowdown. Even the early years of the global recovery saw a return to that baseline, but it was false. Since 2012, export growth has disappeared meaning the rest of the global economy wasn’t really recovering, either. Starting in late 2014 and really at the outset of 2015 (coincident to the non-“transitory” oil crash), lack of export growth turned into export contraction. To some economists, this is “lackluster.” To common sense, it means desperate times to which “stimulus” isn’t and that there is no monetary magic; there never was.